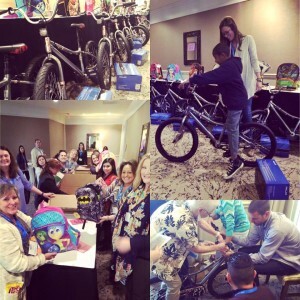 ExamOne had a Corporate Team charity bike for kids through the local Salvation Army. They built some excellent bikes for some great kids at Hilton Head Island, South Carolina. Lauren Davis with ExamOne did an amazing job organizing the event. The builders were supported by Mike Fink of Mike’s Bikes on the Island. Good deeds by a Lauren and her great team at ExamOne. Bikes for Goodness Sake is a charitable organization- 501c(3) – with a mission to share to Goodness of Bicycles with underprivileged children through sponsored corporate charity bike build events. We help corporate, personal, and group sponsors create charity bike build events that give back to the communities that they live in. This is what a corporate team charity bike build is about.